A Dallas Cowboys scouting assistant was permanently paralyzed from the waist down after his spine was severed during the collapse of the team's tent-like practice structure in a severe storm. The team announced Rich Behm was in stable condition at Parkland Hospital on Sunday after surgery to stabilize a fracture to the thoracic spine. The 33-year-old Behm was among a dozen people hurt in the accident Saturday, and was one of three Cowboys staffers who remained hospitalized. Joe DeCamillis, 43, the team's new special teams coach, sustained a fracture of one of his cervical vertebrae without paralysis. He was in stable condition at Parkland and scheduled for surgery Monday. Assistant athletic trainer Greg Gaither, 35, had surgery Saturday night to repair a fracture to the tibia and fibula in his right leg. He is expected to be released from the Baylor Regional Medical Center later this week. "To the Behm family we extend our love, comfort, and the full support of every person and resource within the organization," Cowboys owner Jerry Jones said in a statement. "Rich is a courageous member of our family and someone for whom we care deeply. We ask for all friends and fans of the Dallas Cowboys to join us in embracing him and his family with their thoughts and prayers at this very difficult time." Behm has a brother who works in the Cowboys television department. Jones, who was attending the Kentucky Derby on Saturday when the accident occurred, didn't stop to talk to media outside the team's Valley Ranch headquarters Sunday morning when he arrived or left. Jones had a somber look on his face and his hands tucked in his pockets when he surveyed the mangled mess. 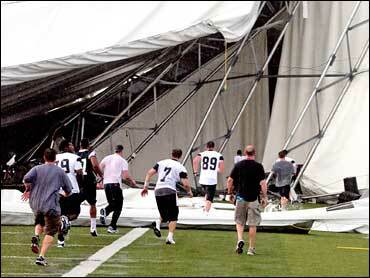 About 70 people, including 27 players attending a rookie minicamp, were in the structure when the storm hit. Wind in the area around that time was clocked at 64 mph, a single mph shy of the threshold for a weak tornado. National Weather Service officials said a "microburst" may have pushed the wind beyond 70 mph at the top of the structure that was built in 2003. Most of the 27 players taking part in the minicamp were drafted the previous weekend or signed as undrafted rookies. None of the team's veterans were involved. Coaches, support staff and media were also in the structure. The final scheduled practice of the three-day minicamp was canceled Sunday, though the players attended meetings. Cowboys spokesman Rich Dalrymple said all 27 players were there Sunday, and that none were considered among the injured. Media were restricted from the Cowboys headquarters Sunday, a ban the team said would continue through at least the next week "due to ongoing work that is scheduled to take place in the aftermath of the accident." The players arrived together Sunday morning on a bus from the hotel where they were staying. They were off limits to the media, and instructed by the team not to talk about what had happened. Dalrymple said Jones spent "considerable time" Saturday night and Sunday visiting those in the hospital. "As we share concern for everyone who was touched by this accident, we also extend our heartfelt and best wishes to Coach Joe DeCamillis and his family as they prepare for Joe's surgery," Jones said. "We are grateful that Greg Gaither's surgery was successful, and we feel blessed that others involved were able to walk away from this accident after receiving medical attention." Behm, DeCamillis and Gaither were standing on the field when the $4 million structure gave way, sending debris such as the framework and lights crashing to the ground. The no-frills building was pretty much a 100-yard football field with a few more yards of clearance all the way around. The roof was 80 feet high, the equivalent of an eight-story building. Calls to Summit Structures LLC, one of the companies involved in building the $4 million facility, were not returned to The Associated Press on Sunday. The first voluntary full-squad minicamp for the Cowboys is scheduled May 19-21.